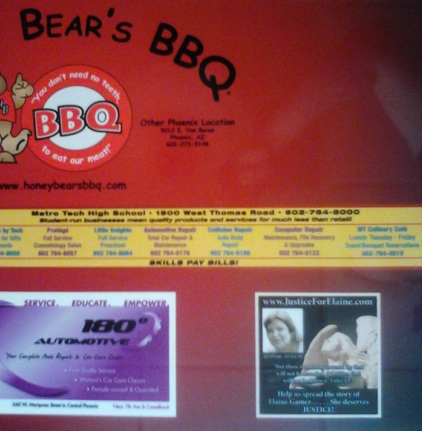 check out this JusticeForElaine Table Ad! We are blessed to be on those tables. The pain is still deep, at times I still can't sleep, have dreams of ur death, so I still heavily weep. I love u ma. Justice For Elaine til my last breath! Your life ended on 05/02/98. Worse day of my life & nothing can ever top it. People see me as a grown woman, an adult, but they fail to realize that I was only 18, when you were murdered & ripped out of my life. I really had no other dreams, but to graduate from high school, finally live with you & the twins, & for us to move away from all the drama in our family & what came along with living in East Chicago, IN. They also fail to realize living with you was a dream of mine. I remember you sitting on the bed & being at my eye level as I stood up on the bed & we counted on my fingers how many years it would be before I could live with you, since your parents adopted me & would raise me. Our family fails to remember my cries of suicide. You were the one thing I told myself I would live for. You became my reason for living. I always thought you were safe. For the most part you had the twins with you everywhere you went, had a heart of gold, you had daily visits to grandma's house, you weren't involved in gangs, drugs, you know that street life that could bring death or jail.......my life is a daily struggle & I still cry for you! 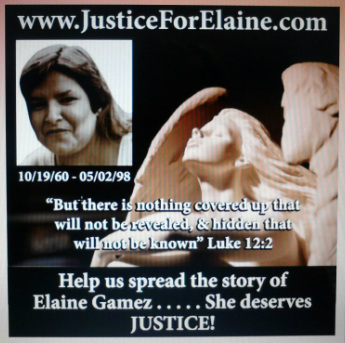 Contribute & help us take Elaine's murder to the next level!!!! The power of a dollar is strong. Please contribute ANY amount, so that we can pay for any services (billboard, reward $, possible private investigator, exhuming the body for re-examination, etc.) that will help us bring my mother Elaine Gamez justice. IF you know a fire investigator or private investigator or a homicide detective that will assist us, please let us know. We need to know facts about how this case was not properly handled. Help us take this to the next level! Michael Jackson is from Gary, Indiana. Transformers 3 was filmed in Gary, Indiana. Well my mother was murdered there! Elaine Gamez deserves justice & a proper investigation. 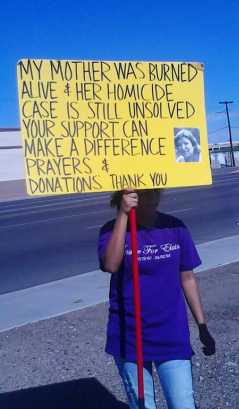 Her murder is still unsolved, but you can help change that. Spread her story, pray, & donate. Donations are needed for a billboard & reward $ to encourage anybody with any information that will lead to an arrest, to step forward. We live in this world together, so why can't we share?